By Andrea Wagner | May 31st, 2018 | News. 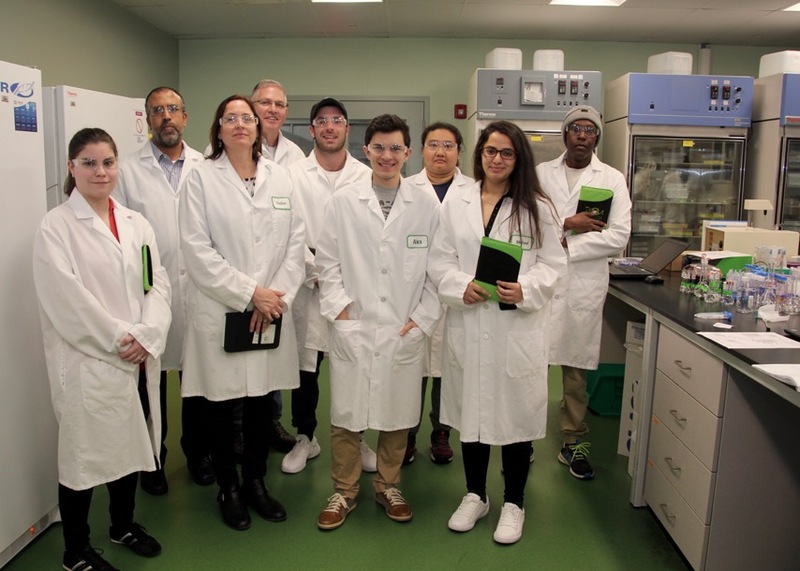 STCC Professor Lisa Rapp, third from left, brought her biotechnology students to Berkshire Sterile Manufacturing, a company in Lee. LEE, Mass. – Student Adel Abdel-Maksoud looks forward to finding work after he receives his certificate in biotechnology from Springfield Technical Community College. He and seven other students in the biotechnology program at STCC recently got a close-up look at a biotech company in Western Massachusetts. They visited Berkshire Sterile Manufacturing in Lee and examined vials and syringes, among other biotech devices, and looked at state-of-the-art equipment designed to produce drugs. They donned white lab coats and slipped on disposable blue shoe covers to keep the floors clean in one section of the plant. They observed scientists in action at the four-year-old company, which is looking to hire. 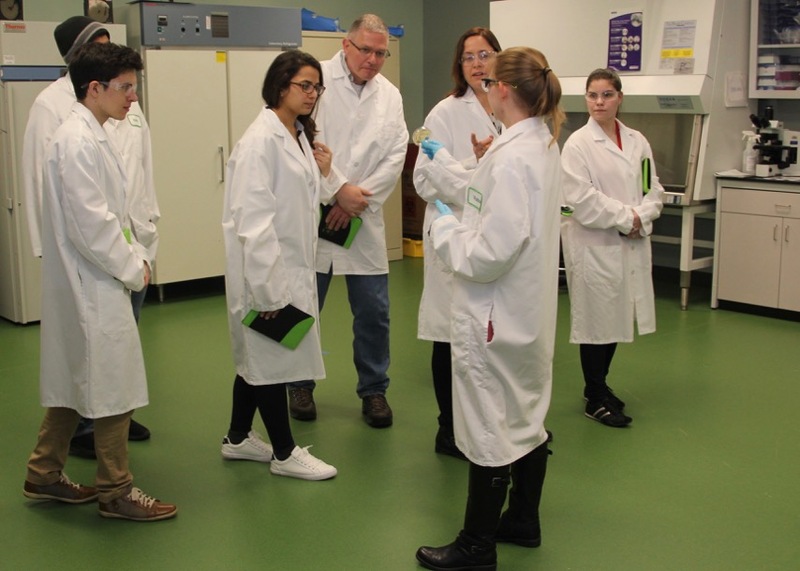 The company’s CEO, Shawn Kinney, offered an interactive tour of his facility, encouraging students to ask questions about everything from the lab equipment and procedures to career prospects in biotechnology. BSM produces small-scale injectable drugs for clinical use. Pharmaceutical companies ship drug substances to BSM to formulate, sterilize and put into vials and syringes. The final drug product is returned to the pharmaceutical company to perform clinical trials to determine if the drug can cure diseases like cancer, Kinney said. “We’ve had some fascinating products in here that are in very early clinical phase studies,” he said. Kinney detailed the meticulous process of manufacturing drugs that are safe for humans. His company’s mission is to provide the safest sterile drug products possible for clinical use. In addition to being sterile, the drug must have the proper concentration (too much would be harmful, while too little would be ineffective), and the drug must be tested for the presence of endotoxins, which can cause fevers and allergic reactions in humans. Berkshire Sterile Manufacturing CEO Shawn Kinney, standing, speaks with STCC biotechnology students. STCC Professor Lisa Rapp, the Biotechnology Department chair, said she has taught her students some of the same concepts Kinney was highlighting. Kinney said biotechnology companies like BSM have open positions for biotechnology graduates with two-year associate degrees and one-year certificates. His company is seeking workers in manufacturing, quality control, quality assurance and engineering. “An associate degree is a great starting point for people,” Kinney said. “We do also have a tuition reimbursement program. We’re very pro-education. We encourage people to go back to school. We’ll reimburse them for the cost of that if it’s job-related. Basically, we would support a student on any science degree. “We find that people with associate degrees have the necessary background in science and math skills, and usually writing skills, and they can do quite well in the position,” he said. STCC Professor Lisa Rapp and biotechnology students hear from an employee at Berkshire Sterile Manufacturing. Kinney said the biotechnology industry continues to boom in Massachusetts, particularly in the Boston area. He leads one of the few biotech companies in Western Massachusetts. Berkshire Sterile has doubled in size, from 35 to 70 employees, since last year. “We’ll be over 100 by the end of this year,” he said. The STCC biotechnology program prepares students for a number of career paths, including jobs in the pharmaceutical industry. Massachusetts has the highest concentration of biotechnology activity in the world. There are more than 500 companies employing over 50,000 people statewide in biotechnology and pharmaceutical companies. Biotechnology encompasses a broad range of applications that use living organisms such as cells and bacteria to make useful products. Current applications of biotechnology include industrial production of pharmaceuticals such as vaccines and insulin, genetic testing, DNA fingerprinting and genetic engineering of plants. According to the industry trade group MassBio, jobs in the Massachusetts biotechnology and pharmaceutical (biopharma) industry grew 4.8 percent in 2016. Companies created more than 3,000 new jobs that year. According to a Boston Globe article about a report by the nonprofit Massachusetts Biotechnology Education Foundation, companies are having a hard time filling vacancies because the biopharmaceutical sector in Massachusetts is growing so quickly. Companies particularly need to fill entry-level jobs that require associate degrees, according to the report. Nearly 12,000 jobs are expected to be created between mid-2017 and mid-2023, which represents a 17 percent increase, the Globe reported. If you’re interested in applying to STCC’s Biotechnology program or have questions, call Admissions at (413) 755-3333. You can also apply online at www.stcc.edu/apply. Click here to see job openings in the biotechnology field.